Cultural, ethnic and geographical roots link one with ancestral origins and the deep strata of evolutionary process.To “put down roots” means to settle into something, materialize potential or recognize a locus of belonging.The roots of an individual extend into layers of personal and archetypal ground. The quality of such rooting, fostered by experience, mirroring and imagination, affects the capacity to thrive, generate new growth and creatively blossom.For the Romani people, their crafts and traditions represent the foundation, origin and source of their identity; their root matter. The main conceptual idea of the root has been successively polished and stylized to generate the wooden arched frames. 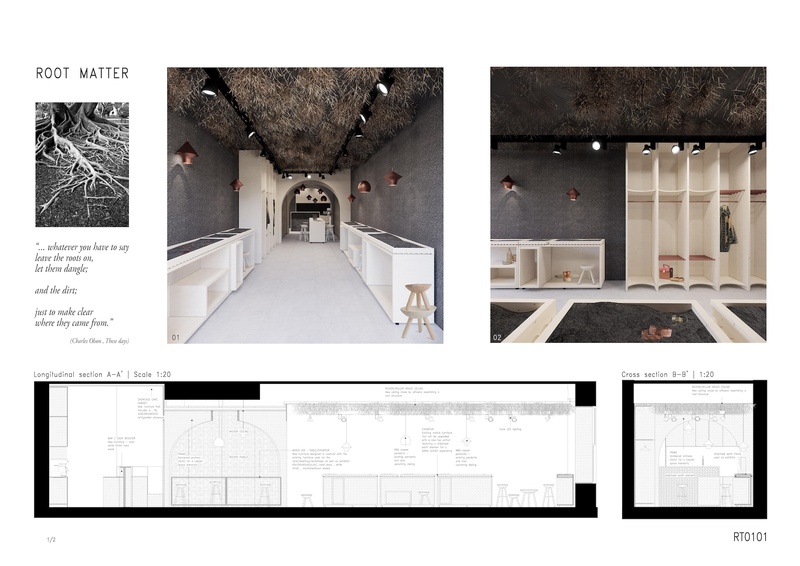 This was used as a central pivoting element , a root which holds and structures the present irregular and chaotic interior space of the shop.In order for the root to exist it must be nurtured , thus we came to use natural and ancestral elements like earth used almost bare with discrete processing to showcase the stark crafts, rugged natural mineral plaster for the walls , hard wood , copper ,wicker and willow branch for furniture . All these are the ingredients of the Romani craft universe that we plan to use creatively to generate a stark and unexampled atmosphere . The first area is the main shop area where the current flexible exhibitors will be maintained as they allow for growth and wrap around many event scenarios as well as exhibits . To sustain our strong concept we proposed enhancing the identity of MBQ by adding another module over the existing exhibitors with a layer of stabilized earth seated in a root-like hard-wood frame . This allows for a uniquely strong , pragmatic and poetic at the same time base to display the MBQ crafts. This module can easily be transported to outside events and fairs to be used in the same manner as the stabilized earth is very versatile in its stability. For showcasing the clothing line we envisioned a furniture that will better isolate and highlight the unique qualities of the designs and fabrics .The second area is constructed for meetings , gatherings , business and workshops. Also it can be used as a showcase area , in which case the space beneath the top table can store the MBQ signature chairs or they can be moved to the bar area . This space is framed by the wooden arches allowing for a very intimate and protective atmosphere. 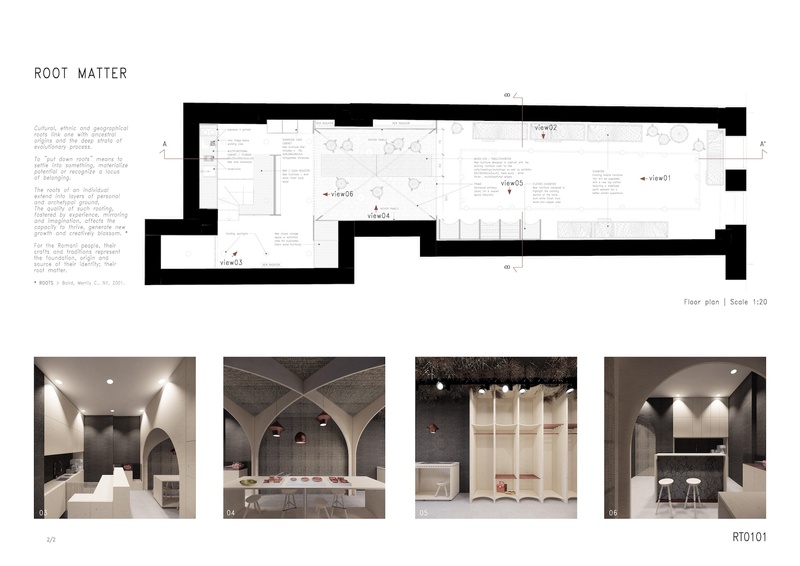 Perceived as a portal , the space reminds of the roots of a tree that twist into the earth , further accentuating this link between roots and origins .The third area is a pragmatic and technical space , housing the bar and its utensils and also the cash register . Here the tall casework will unify the space and allow for spacious storage and even exhibiting items if needed .